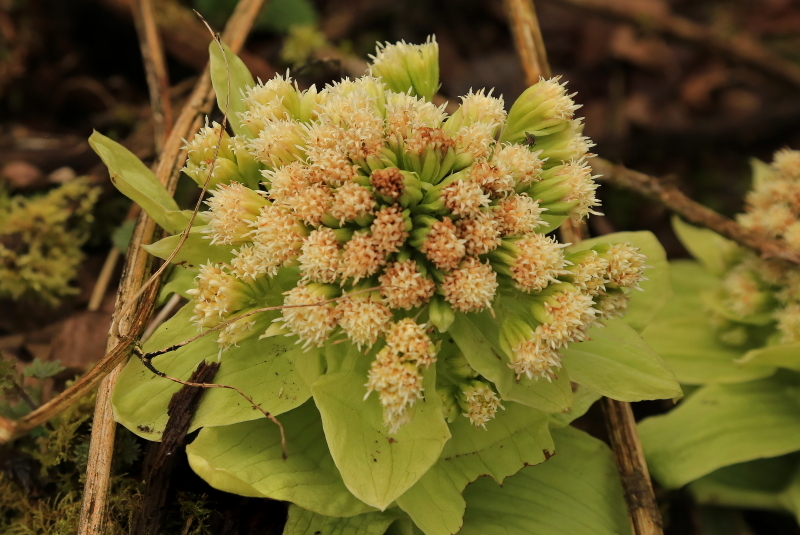 Giant Butterbur is an introduced (alien) species and does grow in places along the Wye valley. It prefers wet and shady places. There is a patch of it growing close to Ninewells wood on the edge of a small stream which flows into Cleddon bog and thus to Cleddon Falls where it is known as Cleddon Shoots, and eventually into the river Wye. I do not think it is a particularly attractive plant. It flowers before the leaves are produced and the flowers look something like a cross between a trifid and a cauliflower. They are white and bulky and look quite alien. In the next photo you can see the leaves just emerging. Later in the year they are quite large and swamp any smaller plants. It has some other interesting names, one is Fuki bog rhubarb !!!! careful how you pronounce that one. The Fuki is because it originates from Japan. The rhubarb is because after it has flowered it produces enormous rhubarb like leaves. 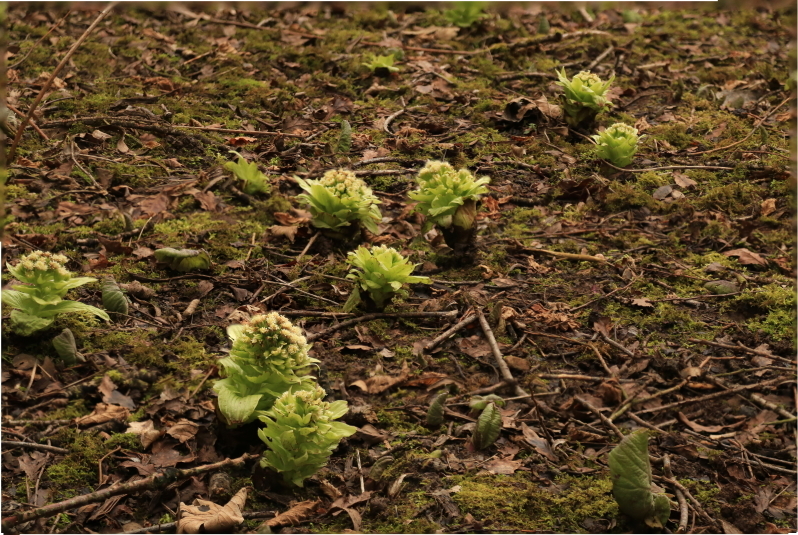 Its scientific name is Petasites japonicas. However it has now been introduced into many parts of the world, possibly because it looks weird but also because it is eaten, particularly in some Japanese cuisine. However it does contain various toxic alkaloids which can cause liver damage and also some are carcinogenic. So proper preparation in order to remove these toxins is essential. I think I will give it a miss. 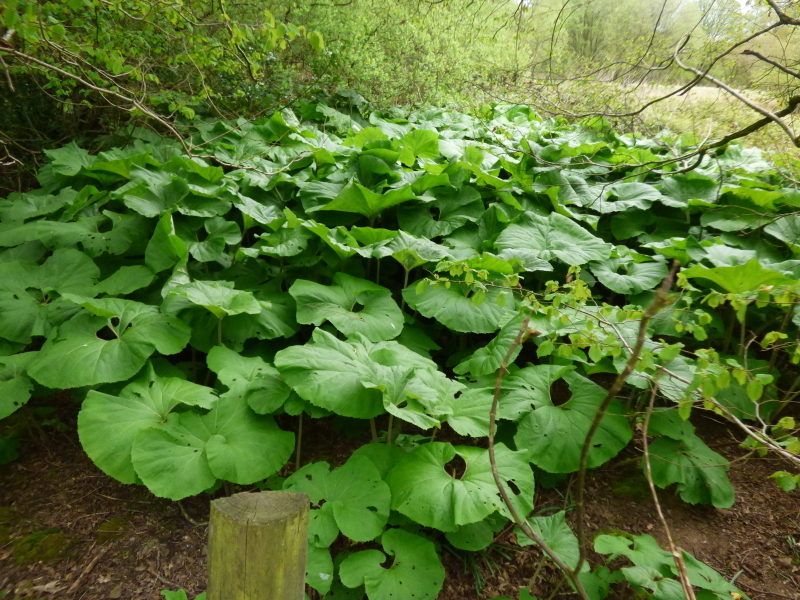 This is why this plant should not be planted or allowed to proliferate, because later in the year it has huge leaves which prevent anything else from growing. 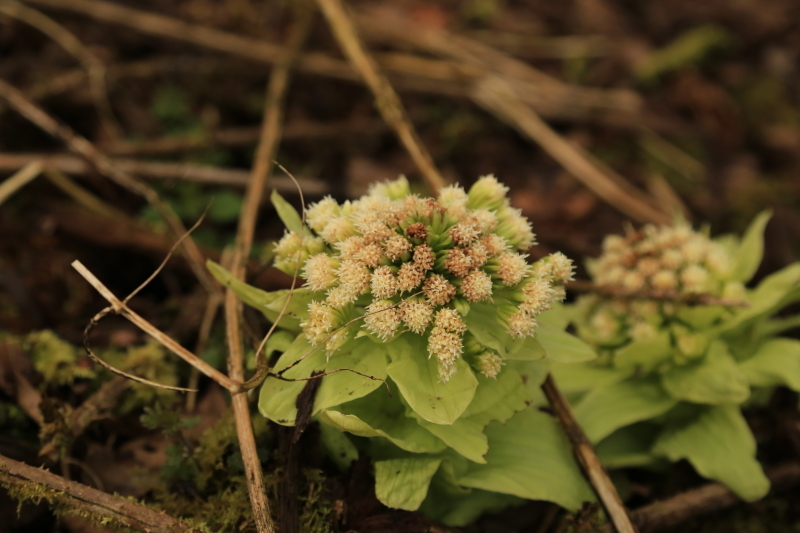 The late snow and frosts of 2018 show that this plant is sensitive to low temperatures. All the photos above were taken in 2016 and 2017. The ones below I took in late March 2018 you can see that the central flowers in each flower head have been affected by the cold and are brown.